Yay Friday eve and first day of September! I don't know about you but I am so ready for this extended weekend! I have a lot of things planned but I'm just happy to have an extra day off even if I will be running around like crazy. We're having a tropical depression move through which has brought slightly cooler temperatures (it's in the mid 80's instead of mid 90's) and I'm soaking up every minute of it since I know it won't last but I'm hoping it doesn't bring rain the entire weekend. I need to get outside and do something instead of being cramped indoors all weekend. When I think of pastels I usually think of spring and only spring. In fact, I'm not one who usually wears pastels at all except for maybe the occasional blush but when I got this top in one of my Le Tote boxes I fell in love with it. The eyelet detail is so dainty and feminine and I love the keyhole detail in the back. Even though I felt like this outfit would be WAY more appropriate in spring I still rocked it to work and out for dinner and drinks. It isn't fall yet so why not, right? I'm sure I could have made it more "fall appropriate" but I was really digging the lilac and white combo so I just ran with it. Which makes me laugh considering just yesterday I was posting a fall inspired outfit. Don't judge me, I'm all over the place. At least I know it! While I'm talking about things being "all over the place", funny enough, probably about an hour before I took these pictures the weather was super rainy and gross and I thought there was no way I was going to be able to get these pictures done (I did them on my lunch break at work) but then the skies opened up and it got kinda sunny. We immediately ran out and took full advantage and I'm glad we did because the second we got back inside it started pouring again. Florida weather is by far some of the craziest I've ever seen but hey, it's home. Love the patterned texture of that top! This top is so pretty and looks amazing on you! Such a cute outfit! Love the colors of that top! This outfit is absolutely adorable! I love the lilac (it's been one of my favorite colors this season) ! Florida weather is absolutely insane- glad you were able to snap these pictures! This is such an adorable look, spring or not wear it! We have been having crazy pop up showers at our house, like only at our house. The rest of the city is on a drought, but we get rain everyday. It's so weird! yes to this outfit. and those shoes which go with all the things :) are those new jeans? i know we discussed :) the outfit is super cute as i'm sporting a bright spring color today too. who am i? ha. back to black tomorrow. anywayyyyy, love the jean jacket with this too - i love a good excuse to wear one! Love the girliness of the top! Those wedge sandals are super cute too! Love the pastels all year long! I can't believe it rained before and after these pictures because the weather looks absolutely perfect during! You look adorable! Loving the pink paired with that white! So perfect with the denim jacket! Super cute!! I kinda feel like you could even pair it with some really dark wash jeans and a pair of caramel booties or wedges and make it like a "fall transition" outfit! Love your outfit. That top is darling. I love this pretty pink on you- looks great with your summer tan! :) And can you believe it's already Labor Day Weekend?! Yiiiiikes, summer flew by! Love this top! Such a pretty color! I love the color of that top, so pretty! I constantly have my jean jacket, it's the best purchase ever. and omg those shoesssss LOVE! haha! I know what you mean, it's like I want to wear fall but it's just too hot still! 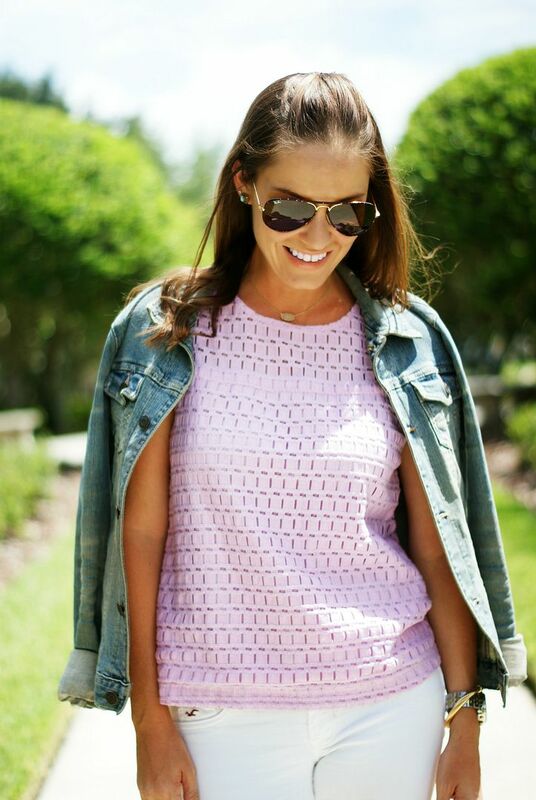 Love this pretty lilac top and you are so right, it's fabulous with the white jeans! Have a great Labor Day weekend! Love this amazing top!! One of my faves of yours. Hope y'all are ok with that hurricane. Have a great long weekend! That shade of pink just looks so gorgeous on you! And I love how you styled it with the denim jacket! Stay safe this weekend with the bad weather! This is such a great color on you and your hair looks fab in these pictures! Cute outfit! it definitely embraces the cooler temperatures Hermine has brought with it. I love jean jackets. They're simple and fun to pair with some of my dressier dresses. What a pretty top! I love the color! It's definitely "springy" but I think it can be summery too!! I hope the weather isn't too bad for you this weekend! Hopefully y'all are still staying ok with the tropical storm/hurricane that blew through earlier this week! That top is so cute, and I love how you paired it with the white jeans and denim jacket! It looks like a great outfit for spring or summer in my opinion! LOVE that pink eyelet blouse... too cute! When I saw you post this outfit last week, I literally "oohed" at the screen, lol! I absolutely love this whole combination, especially the colors! Yes and YES! Those shoes and that top! So cute. We're having cooler weather in LA, too. I'm conflicted because I want fall but also clinging to summer still.